Radiographic examination, especially of the chest and pelvis, is an adjunct to primary survey of trauma resuscitation. Specific skeletal radiographs are a part of secondary or tertiary survey. When there are mass casualties or on a very busy day at the emergency department (ED), non-life-threatening skeletal injuries are often kept waiting for hours for treatment because radiographic examination is delayed. Bedside ultrasound (BUS) has the potential to be a quick, noninvasive, alternative for identifying bone fractures in the ED setting. This study compares the diagnostic utility of BUS [done by emergency physicians (EP)] vs radiography for identifying long bone fractures in the ED. A prospective, convenience sample, study comparing the efficacy of BUS vs radiography to detect fractures was conducted in the ED of a level 1 trauma center in New Delhi, India; this ED treats about 50000 patients annually. From May to October 2009, pediatric patients up to the age of 17 years with complaints of post-traumatic arm, elbow, forearm, wrist, leg, and ankle pain were included in the study after informed consent was taken. The study was done after obtaining clearance from the institute's ethical committee. Patients with injury sustained more than 72 hours prior to presentation, previous fracture at the affected site or evidence of obvious deformity, femur fractures, spine or pelvic injuries, and life- and limb-threatening injuries were excluded. BUS examinations were done by four EPs, who included one consultant in emergency medicine, two senior residents in orthopedics, and one senior resident in surgery. None of these EPs were credentialed as registered diagnostic medical sonographers; their training comprised a 1-day didactic program followed by a hands-on training session to detect fractures. The EPs were only recruited after they had performed 10 positive and 10 negative supervised scans to detect fracture. Before obtaining a radiograph, the EP performed sonographic evaluation of the affected region using a high-frequency (7-10 MHz) linear array with a 38-mm-thickness probe. 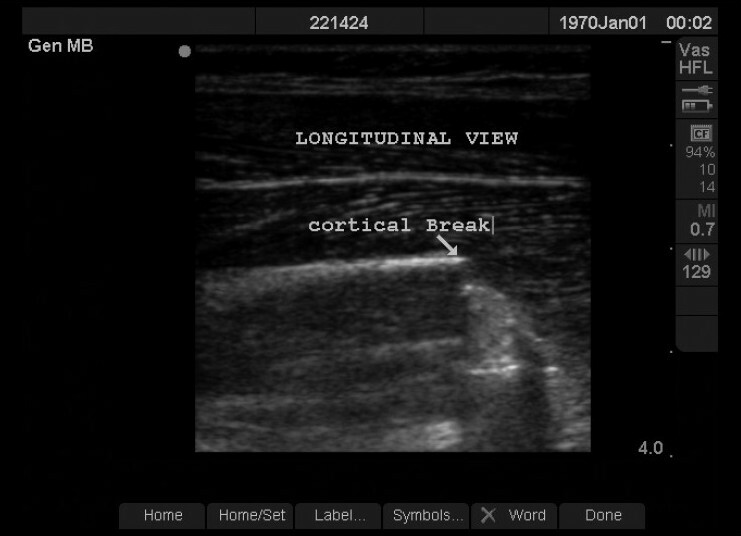 To detect the presence or absence of fracture the ultrasound probe was moved along the transverse plane (to detect 'skip') and the longitudinal plane (to detect any defect in the cortex), and the EP recorded his/her findings [Figure 1] and [Figure 2]. Radiographs were then taken and reviewed for the presence of fracture by a blinded orthopedic specialist. The EPs were blinded to the radiographic findings. The final disposition of the patient was done by the orthopedic specialist and EPs not involved in the study. The sensitivity, specificity, positive predictive value, negative predictive, and positive and negative likelihood ratio of BUS and radiography were then compared to determine the utility of BUS in identifying fractures. We used Stata® version 11 (StataCorp LP, Texas, USA) for analysis of the data. Forty-one patients of age 7-17 years (average: 12.7 years) were enrolled in the study. Seventeen (41%) patients had upper limb injury; the other 24 patients (58%) had lower limb injury (12 ankle, 4 knee, and 8 leg). All patients had pain at the injured area but only 29 (71%) had point tenderness. Only nine patients had fracture and out of these eight were picked up by BUS. All the patients with fracture had point tenderness [Table 1]. The overall sensitivity of BUS in detecting fracture was 89% [95% confidence interval (CI): 51% to 99%] and the specificity was 100% (95% CI: 87% to 100%). The positive predictive value (PPV) of BUS was 100% (95% CI: 82% to 100%) and the negative predictive value (NPV) was 99%. The likelihood ratio of a positive ultrasound result was infinity (divided by zero situations), while the likelihood ratio of a negative ultrasound result was 0.03 (95% CI: 0.01 to 0.22) [Table 2]. In one patient BUS failed to pick up a fracture that was recognized on subsequent radiography. This patient presented with swelling and point tenderness at the right elbow, without any obvious deformity; the radiograph showed a nondisplaced fracture of the lateral condyle of the ulna. Radiography is the conventional diagnostic tool for examining orthopedic injuries. However, exposure to radiation is of particular concern in pediatric populations. BUS can be a noninvasive screening tool to effectively identify fractures in the ED setting. The present study aimed to examine whether BUS was a feasible screening tool to detect fracture in the ED. We were able to accurately identify fractures with high sensitivity (89%) and specificity (100%). Hόbner et al. found good correlation between ultrasound and radiography for fractures of the long bones of the upper and lower limbs, but ultrasound was not reliable in compound injuries, fractures adjacent to joints, lesion of the small bones of hand and foot, non-displaced epiphyseal fractures (Salter-Harris type 1), or injuries with a fracture line of less than 1 mm. Consistent with their findings, the one fracture that was missed with BUS in our study was close to a joint (the elbow). Possible explanations for the failure of BUS to detect this fracture could be that 1) the contour of the bone near this joint is such that it makes diagnosis difficult and 2) in our study we did not recognize or include hemarthrosis or lipoarthrosis as criteria for suspecting fracture. Studies that also considered lipohemarthrosis as a criteria for diagnosis of fracture have shown that BUS can aid in diagnosis of occult fractures in the knee. The relatively high negative predictive value of BUS indicates that BUS can play an important role in ruling out fracture in the pediatric population in whom unnecessary exposure to radiation is of particular concern. BUS can be utilized by EPs after brief training to accurately identify long bone fractures. BUS has its limitations in detecting periarticular fracture. It may also gain popularity due to its rapid diagnostic ability, particularly in a busy ED or when dealing with mass casualties. This study had certain limitations. First, the sample size of the study was small and all subjects were from a single center. Second, in our study sample there is a relative lack of fractures at sites near joints (ankles, knees, elbows) and arm. 1. Young JW, Kostrubiak IS, Resnik CS, Paley. Sonographic evaluation of bone production at the distraction site in Ilizarov limb-lengthening procedures. AJR Am J Roentgenol 1990;154:125-8. 2. Mahaisavariya B, Songcharoen P, Chotigavanich C. Soft-tissue interposition of femoral fractures: Detection by ultrasonography during closed nailing. J Bone Joint Surg Br 1995;77:788-90. 3. Simanovsky N, Lamdan R, Hiller N, Simanovsky N. Sonographic detection of radiographically occult fractures in pediatric ankle and wrist injuries. J Pediatr Orthop 2009;29:142-5. 4. Bonnefoy O, Diris B, Moinard M. Acute knee trauma: Role of ultrasound. Eur Radiol 2006;16:2542-8. 5. Rutten MJ, Jager GJ, de Waal Malefijt MC, Blickman JG. Double line sign: A helpful sonographic sign to detect occult fractures of the proximal humerus. Eur Radiol 2007;17:762-7. 6. Fusetti C, Poletti PA, Pradel PH, Garavaglia G, Platon A, Della DR, et al. Diagnosis of occult scaphoid fracture with high-spatial-resolution sonography: A prospective blind study. J Trauma 2005;59:677-81. 7. Patten RM, Mack LA, Wang KY, Lingel J. Nondisplaced fractures of the greater tuberosity of the humerus: Sonographic detection. Radiology 1992;182:201-4. 8. Chen L, Kim Y, Moore CL. Diagnosis and guided reduction of forearm fractures in children using bedside ultrasound. Pediatr Emerg Care 2007;23:528-31. 9. Chinnock B, Khaletskiy A, Kuo K, Hendey GW. Ultrasound-guided reduction of distal forearm fractures by emergency physicians. Ann Emerg Med 2008;52:422. 10. Barata I, Gong J, Suppiah A, Kapoor M, Shekher M, Siciliano G, et al. 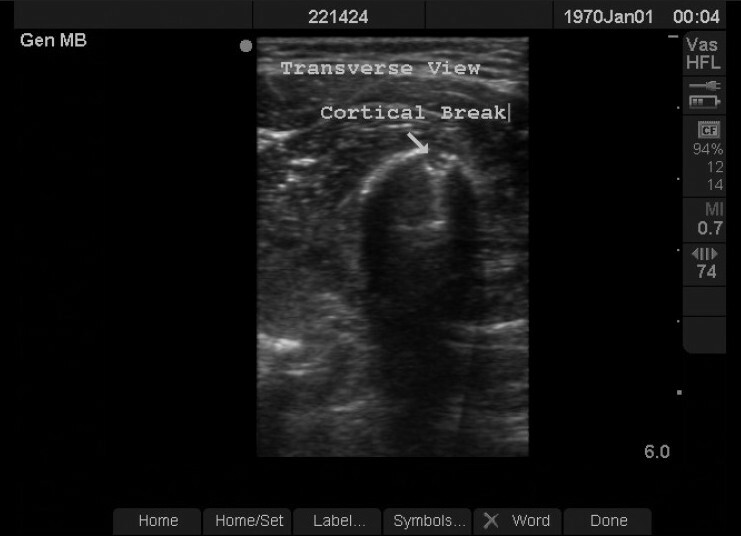 The utility of bedside ultrasonography in identifying fractures in the emergency department. Ann Emerg Med 2008;52:60. 11. Patel D, Blumberg, Stephen M, Crain, Ellen F. Utility of Bedside ultrasonography in identifying fractures and guiding fracture reduction in children. Pediatr Emerg Care 2009;25:805. 12. Hubner U, Schlicht W, Outzen S, Barthel M, Halsband H. Ultrasound in the diagnosis of fractures in children. J Bone Joint Surg Br 2000;82:1170-3. Joshi, N. and Lira, A. and Mehta, N. and Paladino, L. and Sinert, R.